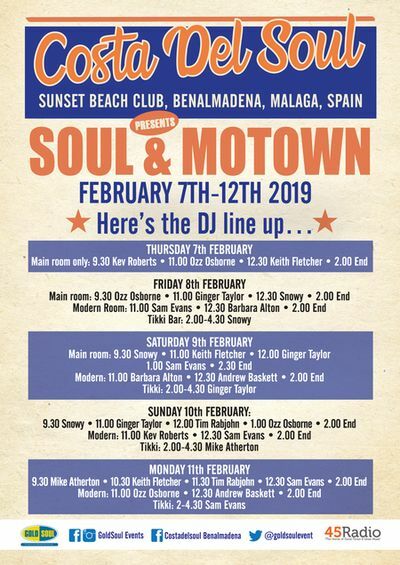 Northern Soul promoters, GoldSoul, are heading back to Sunset Beach Club this February with another edition of their 5-night winter soul break. As many of you know, for the last 11 years we’ve welcomed GoldSoul for their week-long Costa del Soul events. These usually take place at the end of October, and are, undeniably, the top soul music events on the Costa del Sol. Building on the success of their autumn Costa del Soul holidays, GoldSoul recently added a new event to their calendar: a 5-day Soul and Motown Break! From the 7th to 12th February (2019) Soul and Motown music fans can enjoy a fun-packed break in the sun with music every night in the Sunset Beach Club Moonlight Theatre. Some of the UK’s top northern soul DJ’s will be flying in especially for this Soul music weekend including Kev Roberts, Snowy, Ozz, Ginger Taylor, Keith Fletcher, Mike Atherton, Tim Rabjohn, Andrew Baskett, Sam Evans, Barbara Alton as well as other DJ’s and guests. If you’re a Soul and Motown music fan and are interested in more information about this weekend break, please contact www.goldsoul.co.uk . You’ll be able to book a full package including accommodation and full entertainment pass for all the shows throughout the 5 days. This is a privately organised event; however, hotel guests and non-residents are welcome to join in the fun. Entrance fee will be €10 per person and night and is payable at the door each night. Poolside: 2:00pm to 4:30pm Snowy. Have You Made Any Plans For Valentine’s Day? On the Friday 8th February I and 25 friends turned up for what we thought would be a lovely afternoon of good music good bar good time to have. Instead the bar was closed there were no tables and only after alot of begging someone did dump some chairs for us to sit on. We attended the afternoon sessions in October and had a thoughly lovely time shame was not replicated in February. Hi Carol, we’re sorry you were disappointed but the February event is always slightly different to the October one. It was agreed with the organisers that the afternoon sessions would take place on the terrace of the Oasis Restaurant as the pool bar is closed at this time of year.